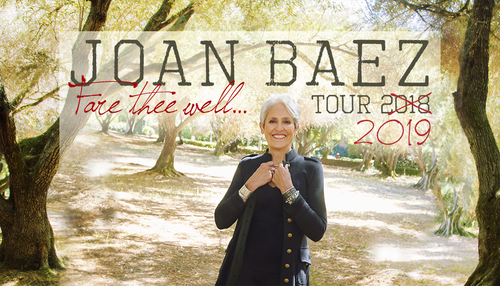 Six decades after becoming a regular on the coffee house scene that was emerging around Club 47 in Cambridge, MA, Joan Baez determined that “2018 will be my last year of formal extended touring.” With her 2017 Rock And Roll Hall Of Fame induction topping off a lifetime of awards and honors for her recordings and human rights achievements around the globe, the symmetry of Joan’s decision reverberates. “I’m looking forward to being on the road with a beautiful new album about which I am truly proud,” she said. “I welcome the oppor­tun­ity to share this new music as well as longtime favorites with my audiences around the world.” VIP Dinner Packages Available. Call 205 975 4012 For More Details.